Astronomers have discovered a record-breaking star system. It’s called IGR J17062-6143, and it’s a very compact binary, where one of the stars is a rapidly spinning, superdense neutron star called an X-ray pulsar. The two stars take just 38 minutes to orbit each other. That’s the fastest orbital period of any X-ray pulsar binary ever observed. IGR J17062-6143 (or J17062 for short) was only discovered in 2006; it’s very low mass, and very faint, and around 7.3 kiloparsecs, or 23,809 light-years, away. It’s been studied fairly extensively, but finding out more about it required some pretty up-to-date technology – NASA’s Neutron star Interior Composition Explorer (NICER), an X-ray detection instrument installed on the International Space Station in June 2017. Previous research had revealed an accretion disc associated with the binary, and that one of the stars was a pulsar, but a 20-minute 2008 observation using NASA’s Rossi X-Ray Timing Explorer could only set a lower limit for the binary’s orbital period. Neutron stars are also extremely hot, and shine extremely brightly. However, because they’re so small, they’re difficult for us to see – except in X-ray. They can also spin incredibly fast, which creates an electric field that accelerates electrons away from the poles, creating relativistic radiation jets. If this beam passes between us and the pulsar, we can see it flash, or “pulse”, like a cosmic lighthouse. It was by observing these X-ray jets that the 2008 observation led to the discovery – the J17062 pulsar was rotating 163 times per second, nearly 9,800 revolutions per minute. NICER has been able to observe the system for a lot longer – over 7 hours of observing time taken over 5.3 days in August 2017. This has allowed researchers to obtain a lot more detailed information. As well as the 38-minute orbital period, researchers were able to ascertain that the two stars are separated by a distance of just 300,000 kilometres (186,000 miles) – less than the distance that separates Earth and the Moon. These two factors, and analysis of the spectra produced by the binary, has led the research team on the new paper to the conclusion that the pulsar’s companion star is a very low-mass, low-hydrogen white dwarf, only around 1.5 percent the mass of the Sun. “It’s not possible for a hydrogen-rich star, like our Sun, to be the pulsar’s companion,” said lead researcher Tod Strohmayer, an astrophysicist at NASA Goddard. The pulsar, by comparison, is around 1.4 times the mass of the Sun, but much, much smaller. Neutron stars – of which pulsars are a subset – are the collapsed cores of stars below around three times the mass of the Sun, in the final stage of their life cycle. They’re usually only around 10-20 kilometres in diameter. Because they’re so massive, though, neutron stars have a pretty strong gravitational pull – hence the accretion disc, as the J17062 pulsar pulls material from the white dwarf, the binary’s ‘donor star’. That high mass imbalance also means that the central point of the orbit – circular, as the team discovered – is much closer to the pulsar, just 3,000 kilometres (1,900 miles) from it. It’s so close that the white dwarf almost seems to be orbiting a stationary star; but, although faint, it does exert a gravitational pull on the pulsar. Earth is surrounded by a protective magnetic environment — the magnetosphere — shown here in blue, which deflects a supersonic stream of charged particles from the Sun, known as the solar wind. As the particles flow around Earth’s magnetosphere, it forms a highly turbulent boundary layer called the magnetosheath, shown in yellow. 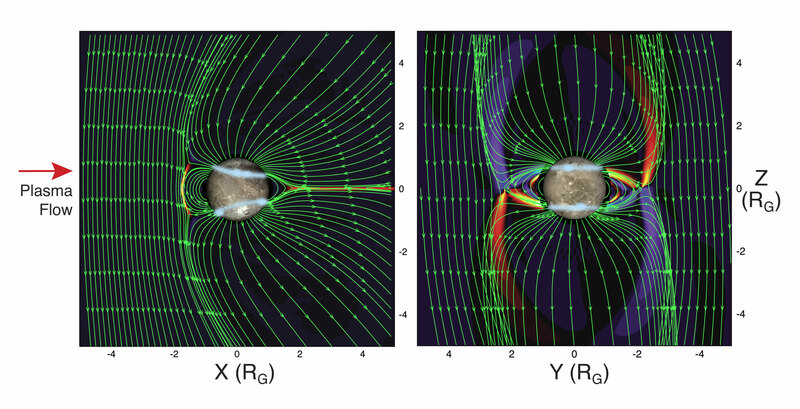 Scientists, like those involved with NASA’s Magnetospheric Multiscale mission, are studying this turbulent region to help us learn more about our dynamic space environment. As the particles flow around Earth’s magnetosphere, it forms a highly turbulent boundary layer called the magnetosheath, shown in yellow [in video]. Scientists, like those involved with NASA’s Magnetospheric Multiscale mission, are studying this turbulent region to help us learn more about our dynamic space environment. Magnetic reconnection occurs throughout the universe, so that when we learn about it around our planet — where it’s easiest for Earthlings to examine it — we can apply that information to other processes farther away. The finding of reconnection in turbulence has implications, for example, for studies on the Sun. It may help scientists understand the role magnetic reconnection plays in heating the inexplicably hot solar corona — the Sun’s outer atmosphere — and accelerating the supersonic solar wind. NASA’s upcoming Parker Solar Probe mission launches directly to the Sun in the summer of 2018 to investigate exactly those questions — and that research is all the better armed the more we understand about magnetic reconnection near home. Sometimes on a dark night near the poles, the sky pulses a diffuse glow of green, purple and red. Unlike the long, shimmering veils of typical auroral displays, these pulsating auroras are much dimmer and less common. While scientists have long known auroras to be associated with solar activity, the precise mechanism of pulsating auroras was unknown. Now, new research, using data from NASA’s Time History of Events and Macroscale Interactions during Substorms — or THEMIS — mission and Japan’s Exploration of energization and Radiation in Geospace — shortened to ERG, or also known as Arase — satellite, has finally captured the missing link thought responsible for these auroras. The answer lies in chirping waves that rhythmically pulse the particles that create the auroras. Earth’s magnetic bubble — the magnetosphere — protects the planet from high-energy radiation coming from the Sun and interstellar space, but during particularly strong solar events, particles can slip through. Once inside, the particles and the energy they carry are stored on the nightside of the magnetosphere, until an event, known as a substorm, releases the energy. The electrons are then sent speeding down into Earth’s upper atmosphere where they collide with the other particles and produce the characteristic glow. Pulsating auroras, however, have a slightly different cause. The magnetosphere is home to a type of plasma wave known as whistler mode chorus. These waves have characteristic rising tones — reminiscent of the sounds of chirping birds — and are able to efficiently disturb the electrons. When these waves make their appearance within the magnetosphere, some of the electrons scattered by the wave careen down into Earth’s atmosphere, causing the pulsating auroras. Research done with NASA’s ground-based camera and Japan’s spacecraft in the near-Earth laboratory has applications further afield. 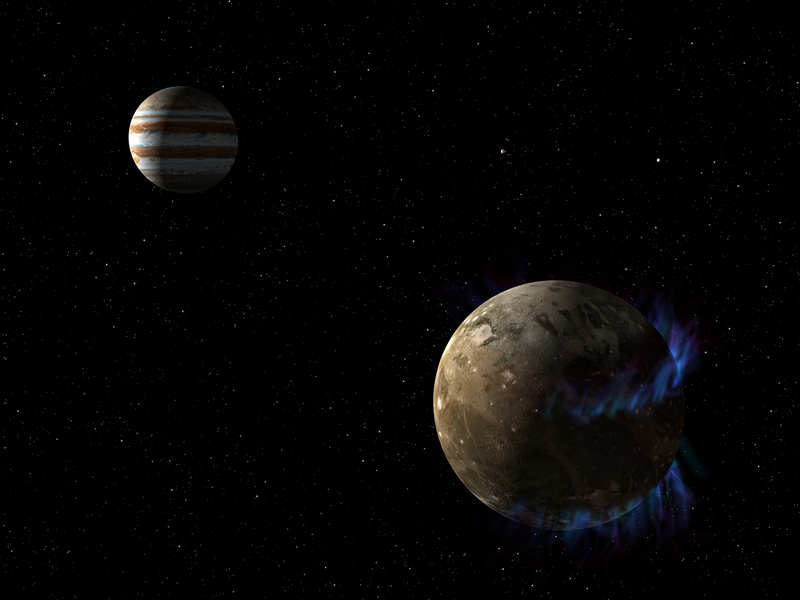 Chorus waves have been observed around other planets in the solar system, including Jupiter and Saturn. Likely, the processes observed around Earth can help explain auroral features on these gas giants as well as on planets around other stars. The results also help scientists better understand how plasma waves can influence electrons — something that occurs in processes across the universe. Illustration of the ERG satellite in orbit. NASA has begun operating the last satellite of its kind in the network that provides communications and tracking services to more than 40 NASA missions, including critical, real-time communication with the International Space Station. Following its August launch and a five-month period of in-orbit testing, the third-generation Tracking and Data Relay Satellite (TDRS), referred to as TDRS-M until this important milestone, was renamed TDRS-13, becoming the tenth operational satellite in the geosynchronous, space-based fleet. The 10 TDRS spacecraft comprise the space-based portion of the Space Network, relaying signals from low-Earth-orbiting missions with nearly 100 percent coverage. ​TDRS-13 launched on Aug. 18, 2017, aboard a United Launch Alliance Atlas V rocket from Cape Canaveral Air Force Station in Florida. Built by Boeing in El Segundo, California, TDRS-13 and its nearly identical third-generation sister spacecraft are performing well. TDRS-K and -L launched in 2013 and 2014, respectively. NASA established the TDRS project in 1973, and the first satellite launched 10 years later, providing NASA an exponential increase in data rates and contact time communicating with the space shuttle and other orbiting spacecraft, such as the Hubble Space Telescope. Since then, NASA has continued to expand the TDRS constellation and advance the spacecraft capabilities. Goddard is home to the TDRS project, which is responsible for the development and launch of these communication satellites. Boeing, headquartered in Chicago, Illinois, is the private contractor for the third-generation TDRS spacecraft. TDRS is the space element of NASA’s Space Network, providing the critical communication and navigation lifeline for NASA missions. NASA’s Space Communications and Navigation (SCaN) program, part of the Human Exploration and Operations Mission Directorate at the agency’s Headquarters in Washington, is responsible for NASA’s Space Network. Sometime in the afternoon – Reviewing the previous night’s data manually – 4 MHz at a time – Tilley detects an unexpected radio frequency signal. Analyzing the specifics of its Doppler Curve – the way the frequency modulates as it crosses the sky, like the siren of a passing ambulance – and comparing it to the orbital elements logged in the space-track catalog, it came back as NASA spacecraft 26113, corresponding to the IMAGE mission. Unaware of any details of the mission, Tilley shrugged, logged the finding into his database, and continued looking through his data. A few minutes later. Reconsidering his findings — why hadn’t he ever detected the satellite in any previous scans? — Tilley took a closer look. Suddenly a portion of the spectrum just below the data he’d read jumped out. The (relatively weak) signal he’d originally detected had only been a harmonic of the spacecraft’s fundamental frequency, which was much stronger – one of the strongest he’d seen. A review of public frequency lists – where other amateur astronomers post their findings – came up empty. No one else had detected this satellite in recent years. After some research, Tilley turned up an article on EO PORTAL about the IMAGE mission. “But they were referring to IMAGE in the past-tense,” Tilley said. Tilley eventually found IMAGE’s detailed Failure Report which stated that the spacecraft’s power source had likely been tripped, and that NASA had watched to see if it might be rebooted by an extended eclipse. But a 2007 eclipse came and went while IMAGE remained silent, and the mission was declared over. 01:48 am EST – Tilley publishes his findings in a blog post, then spends the next two days at work. 01:38 am EST – Ruminating on his findings with his wife over dinner (who, according to Tilley, admonished him that “someone who’s smart enough to find a lost satellite surely can find the guy who built the thing”), Tilley gets up from the table to do some more research. He discovers the contact information for Dr. James Burch, the IMAGE principal investigator at the Southwest Research Institute in San Antonio, Texas, and emails him about his findings. Burch shares the news with Richard J. Burley, former ground system manager and mission director for IMAGE at Goddard Space Flight Center in Greenbelt, Maryland. Burley (after reportedly having to “clean all the coffee off of my laptop that I spit on it when I saw Jim Burch’s email…”) jumps to action, contacting NASA’s Space Science Mission Operations Office (SSMO) and Deep Space Network (DSN) to alert them. :12 pm EST – Burley begins communicating with a team of IMAGE scientists and engineers. His plan is to first determine if the object sending the signal is indeed IMAGE, and if so, whether the Deep Space Network can communicate with it. 3:31 pm EST – Lisa Rhoads, system engineer and former IMAGE DSN Scheduler at NASA Goddard, recovers the last known Nominal Sequence of Events (NSOE) codes used by IMAGE – essential files used to control the Deep Space Network systems during the execution of pre-pass, pass, and post-pass actions that tell the antennae how to communicate with the spacecraft. She also updates Burley on the ways that the Deep Space Network had changed since 2005. Major changes include the decommissioning of several ground stations and antennae that were used to track IMAGE in the past, as well as several significant functionality changes in how the communications work. 11:02 pm EST – Rhoads begins setting up the software required to communicate with IMAGE, including the NSOE codes. To verify Tilley’s radio frequency observations as well as attempt to directly contact the satellite, NASA team members across the US begin coordinating to verify the downlink signal with a spectrum analyzer and capture a digital spectrum recording. Steve Waldher (NASA’s Jet Propulsion Laboratory in Pasadena, California), Jack Lippincott (JPL) and Lisa Rhoads (Goddard) coordinate to recover and read the old NSOE files. Leslie Ambrose (Goddard) and the Telecom Networks & Technology Branch at Goddard attempt to use a local Near Earth Network antenna to track the spacecraft. Unable to detect a signal on its first attempt, a review of pointing data and center frequency and adjustments are made and another attempt is planned for the following day. Rebecca Besser (Goddard) and Dale Fink (Goddard) create orbit models for IMAGE to determine when recent long-duration eclipses occurred and understand when IMAGE could have been rebooted. They identify an eclipse in mid 2012, which was as long as that of 2007, and another in early 2017, though it was not as long. 11:54 am EST – Engineers at Goddard acquire the downlink signal and analyze its characteristics. Initial readings are consistent with those expected from the IMAGE spacecraft. Further analysis reveals that the signal strength is oscillating, indicating that the target object may be spinning, as would be expected if the object was, in fact, IMAGE. Throughout the day, five antennae located throughout the US—in Greenbelt, Maryland; Laurel, Maryland; Berkeley, California; White Sands, New Mexico; and Wallops Island, Virginia—come online to monitor and track the object. With all five sites producing consistent readings, there is much optimism that it is, in fact, IMAGE. 2:59 am EST – Tilley completes a review of his data archive and sends results to Burley, suggesting based on analysis of the Doppler Curve that the spacecraft has been transmitting since at least May 4, 2017. 9:28 am EST – Notifying the team that the five antennae have agreed on basic radio frequency characteristics of the object, Burley sets the next goal: to read data from the spacecraft. Word continues to spread of IMAGE’s potential recovery. Burley and the team continue to re-work the software and locate documentation in preparation for retrieving data from the spacecraft. Having overcome the first challenges of knowing the signal signature and where to point the antenna to find it, the hard work begins at the Johns Hopkins University Applied Physics Lab, or APL, in Laurel, Maryland, to track and read data from the spacecraft. 9:40 am EST – IMAGE track begins and the APL Satellite Communications Facility, or SCF, team starts the process of trying to achieve “frame sync lock” – locking onto the spacecraft’s telemetry signal to allow data to be retrieved. The SCF team, working with an incomplete set of IMAGE spacecraft RF and telemetry parameters, try different combinations for over seven hours without success. Burley successfully locates a 4 mm tape reader – borrowing a backup from the 1995 Solar and Heliospheric Observatory , or SOHO, mission – and begins attempting to read the 16-year-old tapes. Meanwhile, work continues at APL. 1:40 pm EST – IMAGE track begins again at the APL Satellite Communications Facility. 2:15 pm EST (approximate) – After slowly fine-tuning the parameters for APL’s 18-meter antenna (APL-18) to find the right combination, lead station engineer Tony Garcia achieves frame sync lock from the spacecraft. 2:16 pm EST – Bill Dove, SCF manager and engineer at APL, verifies telemetry data frames are being received and files stored correctly. A quick look at the raw telemetry files show they contain actual spacecraft data. 3:01 pm EST – Bill Dove sends first telemetry file to NASA personnel. 3:21 pm EST – Tom Bialas (Goddard) downloads the first data file, and at last reads its ID number: 166, matching the IMAGE spacecraft. Emails quickly circulate amongst the team that there has been definitive confirmation that the spacecraft is IMAGE. 6:20 pm EST – Engineers at APL start an unattended IMAGE track and continue to capture IMAGE data for a continued 8 ½ hours. The first data is downloaded and its ID read, but actually accessing and decoding the data it contains requires several more steps – and Burley and the team at Goddard are hard at work deciphering them. 12:40 pm EST – The first data files, indicating the state of the spacecraft, are successfully decoded. The team learns that the battery is fully charged at 100%, and its temperature is in line with those in 2005 and historic values. 3:19 pm EST – Engineers at APL continue to capture IMAGE data. Scientists determine that they are now running on Side A of the Power Distribution Unit (PDU) – a surprise given that it had been thought that the side A was dead after a presumed power failure on Thanksgiving Day in 2004. The ultimate cause of the current reboot is still not known, but these findings suggest that a reboot in some form has in fact, occurred. But the data indicate an overall healthy spacecraft. Next steps for the IMAGE team are to see if they can do more than just listen to the spacecraft, and talk back to it. As of Feb. 7, efforts are still underway. The bread loaf-sized IceCube was deployed from the International Space Station in May. One month later, it began science operations gathering global data about atmospheric ice clouds in the submillimeter wavelengths. Credits: NASA. 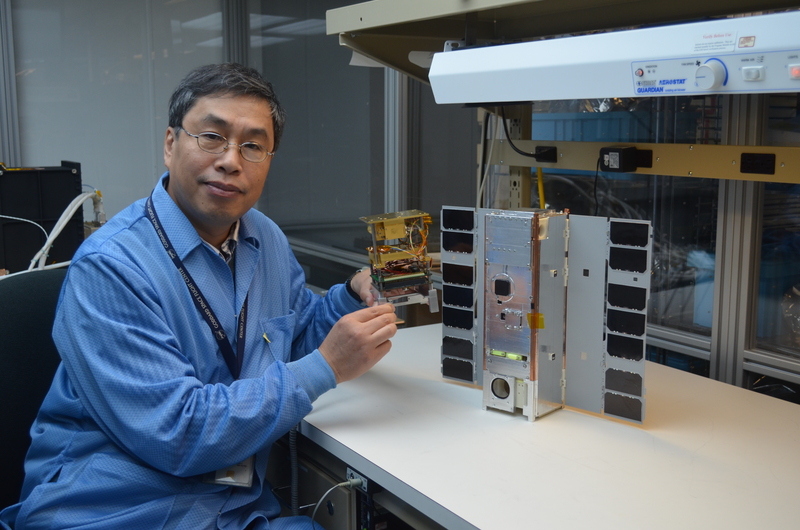 IceCube Principal Investigator Dong Wu set out to demonstrate a commercial 883-Gigahertz radiometer in space, but ended up getting much more: the world’s first ice-cloud map in that frequency. Here he is pictured holding the instrument. Credits: NASA. 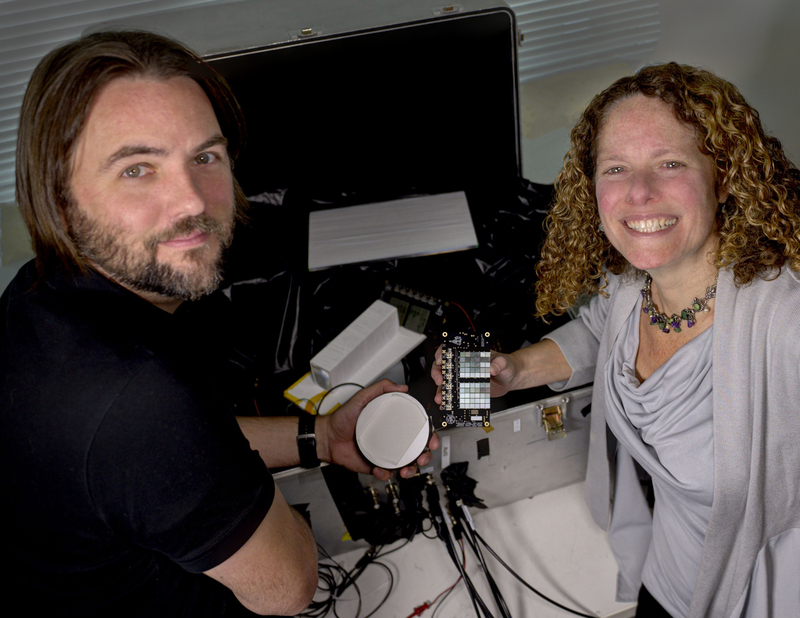 IceCube — the diminutive spacecraft that deployed from the International Space Station in May 2017— has demonstrated-in-space a commercial 883-Gigahertz radiometer developed by Virginia Diodes Inc., or VDI, of Charlottesville, Virginia, under a NASA Small Business Innovative Research contract. It is capable of measuring critical atmospheric cloud ice properties at altitudes between 3-9 miles (5 Km-15 Km). NASA scientists pioneered the use of submillimeter wavelength bands, which fall between the microwave and infrared on the electromagnetic spectrum, to sense ice clouds. However, until IceCube, these instruments had flown only aboard high-altitude research aircraft. This meant scientists could gather data only in areas over which the aircraft flew. Sensing atmospheric cloud ice requires scientists deploy instruments tuned to a broad range of frequency bands. However, it’s particularly important to fly submillimeter sensors. This wavelength fills a significant data gap in the middle and upper troposphere where ice clouds are often too opaque for infrared and visible sensors to penetrate. It also reveals data about the tiniest ice particles that can’t be detected clearly in other microwave bands. IceCube’s map is a first of its kind and bodes well for future space-based observations of global ice clouds using submillimeter-wave technology, said Wu, whose team built the spacecraft using funding from NASA’s Earth Science Technology Office’s (ESTO) In-Space Validation of Earth Science Technologies (InVEST) program and NASA’s Science Mission Directorate CubeSat Initiative. The team’s challenge was making sure the commercial receiver was sensitive enough to detect and measure atmospheric cloud ice using as little power as possible. Ultimately, the agency wants to infuse this type of receiver into an ice-cloud imaging radiometer for NASA’s proposed Aerosol-Cloud-Ecosystems, or ACE, mission. Recommended by the National Research Council, ACE would assess on a daily basis the global distribution of ice clouds, which affect the Earth’s emission of infrared energy into space and its reflection and absorption of the Sun’s energy over broad areas. Before IceCube, this value was highly uncertain. “It speaks volumes that our scientists are doing science with a mission that primarily was supposed to demonstrate technology,” said Jared Lucey, one of IceCube’s instrument engineers. He was one of only a handful of scientists and engineers at Goddard and NASA’s Wallops Flight Facility in Virginia who developed IceCube in just two years. “We met our mission goals and now everything else is bonus,” he said. 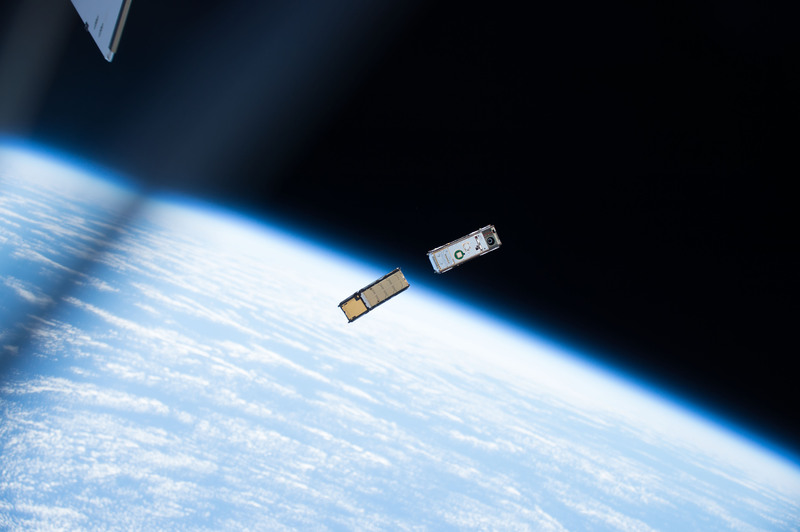 In addition to demonstrating submillimeter-wave observations from space, the team gained important insights into how to efficiently develop a CubeSat mission, determining which systems to make redundant and which tests to forgo because of limited funds and a short schedule, said Jaime Esper, IceCube’s mission systems designer and technical project manager at Goddard. The team used commercial off-the-shelf components, including VDI’s radiometer. The components came from multiple commercial providers and didn’t always work together harmoniously, requiring engineering. The team not only integrated the radiometer to the spacecraft, but also built spacecraft ground-support systems and conducted thermal-vacuum, vibration, and antenna testing at Goddard and Wallops. NASA ESTO supports InVEST missions like IceCube and technologies at NASA centers, industry and academia to develop, refine and demonstrate new methods for observing Earth from space, from information systems to new components and instruments. Babak Saif and Lee Feinberg at NASA’s Goddard Space Flight Center in Greenbelt, Maryland, have shown for the first time that they can dynamically detect subatomic- or picometer-sized distortions — changes that are far smaller than an atom — across a five-foot segmented telescope mirror and its support structure. 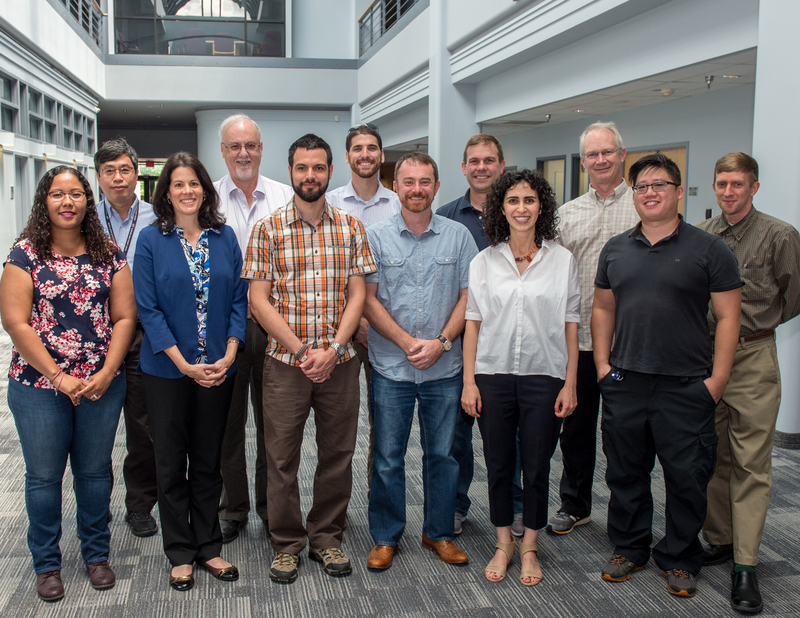 Collaborating with Perry Greenfield at the Space Telescope Science Institute in Baltimore, the team now plans to use a next-generation tool and thermal test chamber to further refine their measurements. The measurement feat is good news to scientists studying future missions for finding and characterizing extrasolar Earth-like planets that potentially could support life. To find life, these observatories would have to gather and focus enough light to distinguish the planet’s light from that of its much brighter parent star and then be able to dissect that light to discern different atmospheric chemical signatures, such as oxygen and methane. This would require a super-stable observatory whose optical components move or distort no more than 12 picometers, a measurement that is about one-tenth the size of a hydrogen atom. To date, NASA has not built an observatory with such demanding stability requirements. Displacements and movement occur when materials used to build telescopes shrink or expand due to wildly fluctuating temperatures, such as those experienced when traveling from Earth to the frigidity of space, or when exposed to fierce launch forces more than six-and-a-half times the force of gravity. Scientists say that even nearly imperceptible, atomic-sized movements would affect a future observatory’s ability to gather and focus enough light to image and analyze the planet’s light. Consequently, mission planners must design telescopes to picometer accuracies and then test it at the same level across the entire structure, not just between the telescope’s reflective mirrors. Movement occurring at any particular position might not accurately reflect what’s actually happening in other locations. To carry out the test, Saif and Feinberg used the High-Speed Interferometer, or HSI — an instrument that the Arizona-based 4D Technology developed to measure nanometer-sized dynamic changes in the James Webb Space Telescope’s optical components — including its 18 mirror segments, mounts, and other supporting structures — during thermal, vibration and other types of environmental testing. Like all interferometers, the instrument splits light and then recombines it to measure tiny changes, including motion. The HSI can quickly measure dynamic changes across the mirror and other structural components, giving scientists insights into what is happening all across the telescope, not just in one particular spot. Even though the HSI was designed to measure nanometer or molecule-sized distortions — which was the design standard for Webb — the team wanted to see it could use the same instrument, coupled with specially developed algorithms, to detect even smaller changes over the surface of a spare five-foot Webb mirror segment and its support hardware. The test proved it could, measuring dynamic movement as small as 25 picometers — about twice the desired target, Saif said. However, Goddard and 4D Technology have designed a new high-speed instrument, called a speckle interferometer, that allows measurements of both reflective and diffuse surfaces at picometer accuracies. 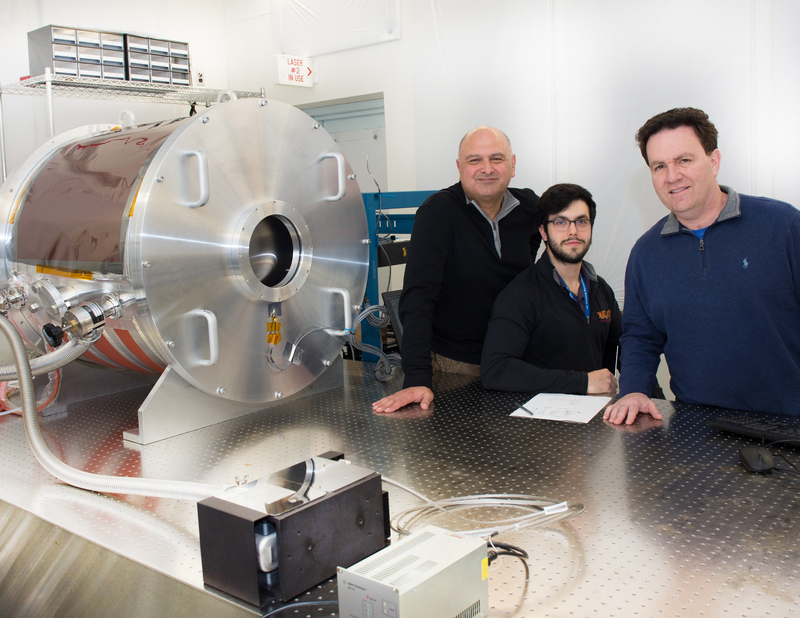 4D Technology has built the instrument and the Goddard team has begun initial characterization of its performance in a new thermal-vacuum test chamber that controls internal temperatures to a frosty 1-millikelvin. Saif and Feinberg plan to place test items inside the chamber to see if they can achieve the 12-picometer target accuracy. “I think we’ve made a lot of progress. We’re getting there,” Saif said.